After being through the various structural changes and demand pressures over the past two years, the real estate sector is expecting the upcoming Interim Union Budget for 2019-20 to rationalise the Goods & Services Tax rates for underconstruction properties, further incentives for affordable housingNSE 0.27 %, and convergence of stamp duties within the GST rates. Given the sector’s linkages with other industriesNSE 2.90 %, contribution to the economy’s growth and support to job creation, most developers continue to reinforce a long pending demand of awarding industry status to the sector. Despite the regulatory approval being in place for quite some time, REITs, a potent instrument of change in the real estate industry, have been held back. To make real estate investment trusts (REITs) more attractive for investors, experts are suggesting making it more tax-efficient for investors. Given the liquidity pressure created by fears of defaults by realty developers and non-banking financeNSE 0.10 % companies (NBFCs) following the IL&FS default in September 2018, experts are also seeking to re-finance NBFCs by raising their limits. 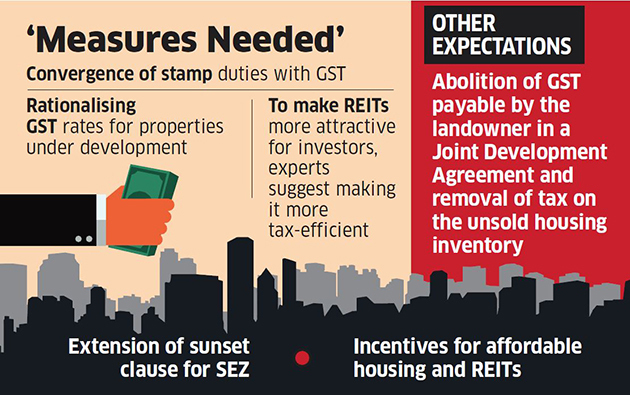 Among other key expectations, most developers want an abolition of GST payable by the landowner in a Joint Development Agreement (JDA) and also removal of tax on the unsold housing inventory.